The Powerpuff Girls is an American animated television series about three little girls in kindergarten who have superpowers. 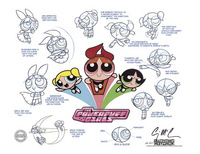 Created by animator Craig McCracken, the program was produced by Hanna-Barbera until 2001 when Cartoon Network Studios took over production for Cartoon Network. The series is a spoof on American superheroes as well as Japanese Tokusatsu heroes like Super Sentai. As is typical in McCracken's work, the show also makes heavy use of references to 1960s pop culture, particularly the famous English musical group The Beatles.